1) Targeted therapeutics and immuno-oncology. Billions of dollars of drugs have been sold because they have demonstrated that they can “extend the life” of the patients who take them. Extending life sounds great, but it’s important to understand that this in no way means that the patient is cured. It would be fairer to say that the average patient lives longer. How much longer? Let’s just say there are billion dollar drugs out there that have been approved because they have been shown to extend average life expectancy by some single digit number of months. To illustrate the point, we have created a couple of charts that try to capture the gestalt without actually describing any specific drug or clinical trial. 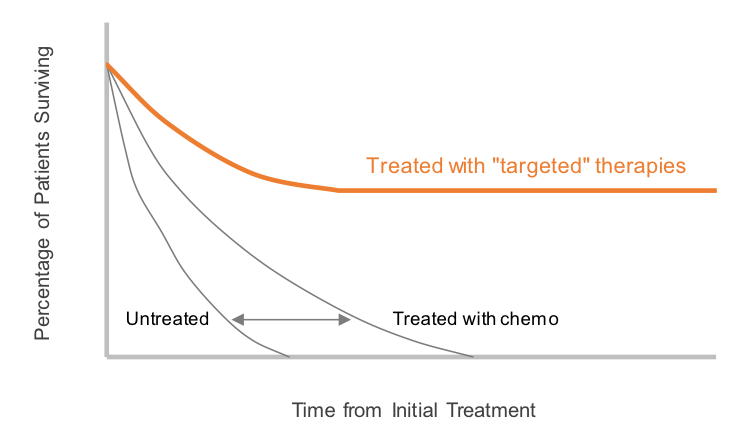 In the chart below, the curve closest to the origin is the mortality for cancer patients who aren’t treated. 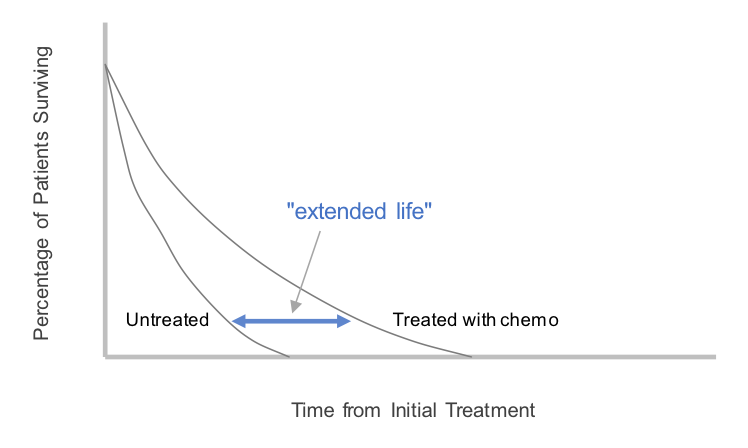 The second curve shows mortality for cancer patients who are treated with what we’ll refer to as conventional chemotherapy. The distance between the two is the amount by which life is extended – typically measured in months. That’s a meaningful improvement, to be sure, but the eye can’t help but be drawn to the right, which shows that mortality from the disease remains 100%. The exciting news is that some relatively new technologies like targeted therapeutics and immuno-oncology not only extend life, but in some cases they appear to cure the patient entirely. The chart below illustrates the difference. The key point to note is the slope of that mortality line. In this context a flat line is good. It means those patients are living normal lives. While the technology is still too new to have data ten and twenty years out, the flat mortality line strongly suggests that those patients will still be alive, and if they don’t survive, it won’t be because of the cancer. Lifting the mortality curve off the x axis is a profound improvement for all concerned. Even better, the techniques used in the development of these early successes are broadly applicable. Thanks to a better understanding of the science, a host of startups are developing a host of therapies, each of which targets a specific cancer genotype. They may not all work, and some will work better than others, but the existence of what are becoming recipes for clinical and subsequent financial success are precipitating a rush to develop the next generation of cancer therapeutics. These exciting developments are viewed through a human being’s perspective. But what about an investor’s perspective? As investors, the value proposition is enormous and pharmaceutical companies will pay almost any price to acquire these technologies. 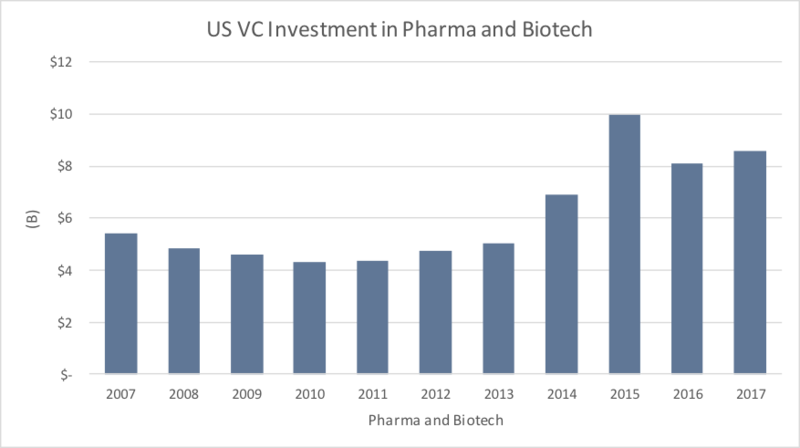 There are dozens of multibillion dollar market cap pharmaceutical companies, many of which are desperate for product, all of which contributes to a very active M&A environment. We’re now beginning to see almost magical results coming from transformative improvements in our understanding of the genome and our ability to manipulate it. Let’s start with a couple of basics. Over the last two decades, the cost of sequencing a genome has collapsed. About five years ago, scientists developed a tool that let us not only read the genome but edit it. They are increasingly able to read, understand, and edit individual genes. Applying this tool set to cancer cells has brought about some of the cancer therapeutics described above. Applying it to human genomes unlocks a whole other category of diseases. It turns out there are a lot of genetic diseases that are produced by defects in a single point gene. Fix the gene and re-inject it into the patient and the result can be cure rates that approach 100% for conditions that previously had 100% mortality. Again, the long term results are not yet known because the therapies are too new, but the results are stunning. This paper summarizes the results of a clinical trial with which I am familiar. Frankly, technical papers of this sort are pretty close to incomprehensible to readers who aren’t PhDs or MDs – so I will share a more understandable, if less rigorous example. Regular readers may recall my association with the Calliope Joy Foundation. The title image used for this blog is a photo from their bi-annual fund-raiser last year. Those three young quarterbacks in the photo all suffer from Metachromatic Leukodystrophy (MLD), a cruel genetic disease that incapacitates its victims in early childhood. All three were participants in the clinical trial described in the technical paper in the link above. 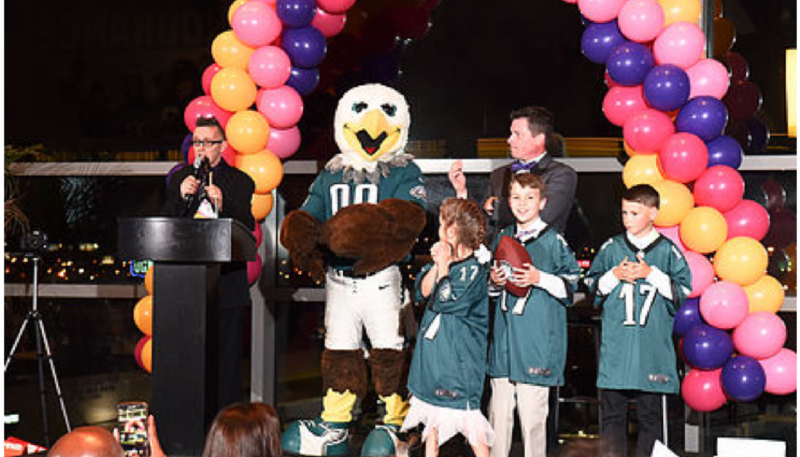 That fact that these children were able to toss passes to the crowd was a miracle even bigger than a maligned backup quarterback earning Super Bowl MVP honors. But I digress. These childrens’ miracles were made possible by gene therapy. At the risk of mixing my sport metaphors, we’re only in the first inning of the gene therapy revolution. There should be many more miracles to come and we expect to see an explosion of investable projects in gene therapy soon. 3) Investment interest has rebounded. As long as we’re thinking like investors, we might as well take a look at capital flows. The chart below shows a surprisingly modest response from the capital markets. The 2008, 2009 period –before these technologies were really available – was a trough. Funding hit a modest peak in 2015 and has been bouncing along comfortably below that peak since. There’s been no rush of capital. Yet. Summing it up, in our view biopharma has phenomenal fundamentals, an attractive exit environment and a reasonable supply of capital. We leave it to readers to draw their own conclusions about how much exposure to life sciences they want in their portfolios.